Should I build my website on WordPress or Squarespace? We’ll go over the pros and cons of each platform and why we prefer using WordPress for development. A lot of people ask us, “What platform should I build my website on WordPress or Squarespace?” People have questions about which platform is better, what are the pros and cons of each and what we use when we develop our websites for clients. This topic is a topic that we have talked about before, but one that still comes up quite often, so we decided to do an updated video on why we prefer WordPress over Squarespace. Now before we get into it, I want to start by saying that we have no problem with Squarespace. This isn’t a post on how we think Squarespace is terrible. We actually think that it’s a really good platform. Squarespace is great for DIYers or people that just want a simple website. They have a great drag and drop system that makes it easy for non-techy people to create a basic website that looks professional. If you don’t need a lot of customizations or bells and whistles, this could be a really great option for you. When it comes to the development of websites for our clients, we like WordPress and here are a few reasons why. The first reason is that WordPress is an open-source platform where Squarespace is closed platform. What does that mean? With Squarespace, you only get what’s in the Squarespace box. If there’s something that you want to customize or do that’s not within their parameters, you aren’t going to be able to do that. With WordPress, you can do a lot more because it’s open source. There’s a ton of different plugins and WordPress development being done by people all over the world, so you can really do whatever you want with your website. If something isn’t already developed, you can develop it yourself, so you really can get a website that looks and functions exactly the way you want it to. Using WordPress for development means that we can do so much more for our clients. The second reason we like using WordPress over Squarespace is because of the SEO benefits. Squarespace offers a couple of different things you can do to optimize your pages, but nowhere near as many options as what is available on WordPress. WordPress offers tons of different plugins and tools for optimization, so you can really get down to the nitty-gritty when it comes to SEO. If search rankings are important to you, we suggest building your website on WordPress over Squarespace. Another big reason why we like WordPress over Squarespace is that you own your entire website. You own the content of your Squarespace website, but when it comes to layouts and the look of everything, you can’t take that with you. A Squarespace theme stays on Squarespace, so you would have to completely rebuild your site if you ever wanted to move to another platform if you wanted the look to remain the same. With WordPress, you can export your entire website (content and layout) and do whatever you want with it. If you need to change servers, do an upgrade or make some updates to your site, you can do that without losing what you already have. As long as there are different platforms to build websites, there will be debates over which is better. At the end of the day, what you choose to build your website on really depends on what your needs are. 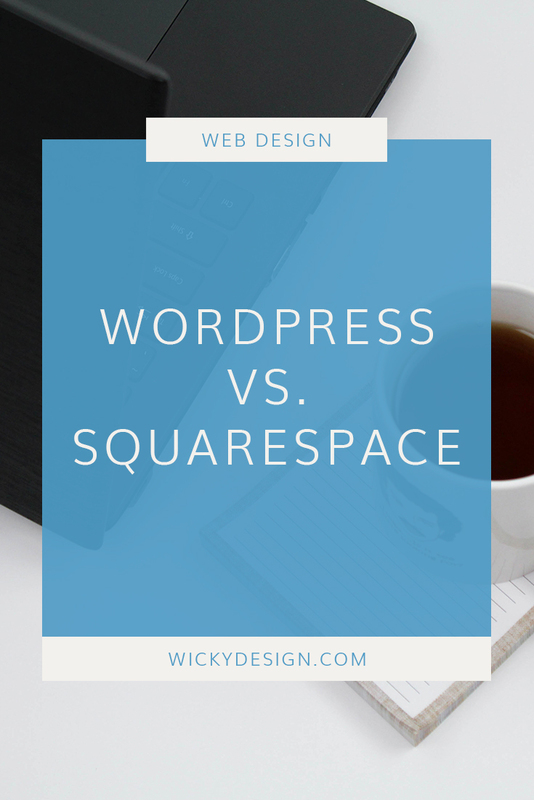 We hope this cleared up any confusion about WordPress vs. Squarespace.